Upper Gelli01938 850037work Self-cateringExclusive 5 star Luxury Self Catering Accommodation. Rural location with stunning views. Children over 16 years of age welcome. Arrival time between 16.00 - 17.00 hrs. Later arrival time by arrangement. Departure time by 10.30 hrs. Prices until march 2019: The Bach £200 per night. Minimum of two nights. 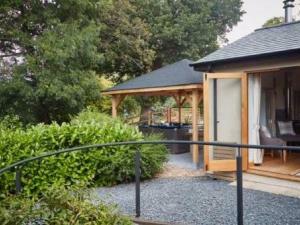 The Lodge £155 per night. Minimum of two nights. Please note. Prices for The Lodge quoted are based on one bedroom occupancy. Surcharge for second bedroom starts from £25 per person per night. Facilities include a private four person Hydropool Self Cleaning Hot Tub, Welcome Basket of local and Welsh products, complimentary Welsh toiletries and beauty products. Bedrooms in The Lodge can be configured as super king or twin beds. Upper Gelli is perfect for getting away from everything, the stunning Bach and the romantic Lodge offer the height of relaxation and provide the ideal base to explore the beautiful landscape, visit extraordinary landmarks and enjoy year round events. Whether you are planning a romantic hideaway, a rural retreat from the hectic pace of life, or exploring the wealth of attractions and great places to eat and drink, Upper Gelli will provide the perfect destination. The Bach Hot Tub. Enjoy a soothing and invigorating experience. Exclusive 5 star Luxury Self Catering Accommodation. Rural location with stunning views. "We wanted to create a magical space that felt like it was all yours...... the perfect rural retreat." Owners Gary and Ros Thomas. Complimentary use of a Hydropool Self Cleaning Four Person Hot Tub at both The Bach and The Lodge. Non smoking throughout The Bach and The Lodge plus surrounding grounds. Enjoy a very special cooking experience all year round in our wonderful BBQ Hut. Authentic Arctic Cabin including cosy reindeer skins. All fuel, cooking implements and crockery provided. Eat in the warmth of the cabin or enjoy alfresco eating with stunning views. Available to our guests at no additional cost. Children welcome from age 16. By train: Please make prior arrangements with Ros to pick you up from the train station. By car: Take the A458 out of Welshpool towards Dolgellau for approximately five miles. After the signpost for Cyfronydd take the turning on the right into Gelli Lane. If you are using sat nav it might tell you that you have arrived when you reach Lower Gelli Farm. Ignore it ! Keep driving up the hill around a couple of sharp bends and you will reach Upper Gelli. The main house, a cream and brown building, will be on your left. Lodge guests please park up in the Barn drive area opposite the house where Ros will welcome you.To drive to the Lodge drive past Upper Gelli House for about 200 yards. On the left hand side you will see a turning space. You will see the sign for Upper Gelli Lodge, if you drive through the metal five bar gate you will find the Lodge at the end of the drive. Ros will provide an individual orientation to the property and facilities. Bach guests please drive past the main house and immediately on the left drive through a five bar gate where you will find the guest parking area where Ros will welcome you and provide an individual orientation to the property and facilities. Gary and Ros look forward to meeting you.